Chrome style banding between the colors is available, but the Cavalier machines never used that originally. PLEASE FEEL FREE TO RESEARCH MY PROFESSIONALISM! Tell me what you want in a vintage machine, and I can guide you to the model that will be the best fit for you! Now think of the wonderful memories you could make with this beautiful Antique investment. (diversify your portfolio while dazzling your children and grand-children). These investments keep going up and up in price, while you enjoy them and make wonderful memories at the same time! YOU WILL NOT BE DISAPPOINTED WITH MINE!!! HAPPY DAYS ARE HERE AGAIN!!! FIRST I NEED TO THANK ALL OF YOU WHO HAVE PATIENTLY WAITED FOR ONE OF MY MACHINES..... THIS MACHINE IS NEWLY RESTORED. THE STOCK MARKET HAS MADE A RECOVERY! 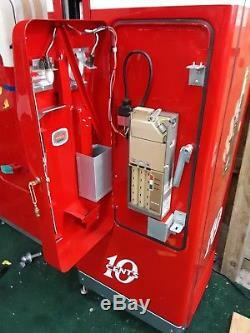 A TRUE AMERICAN ICON This Cavalier 96 Coke machine, made in 1958 was professionally restored, NOT BY AN AMATEUR. 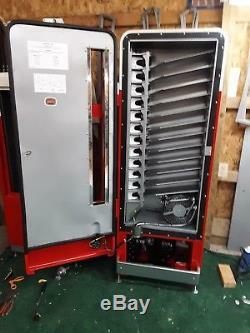 The machine was disassembled down to the bare cabinet, and sandblasted down to the bare metal. It was repainted by a professional body shop with the correct Dupont Enamel, exactly like it was done originally, then undercoated internally before the new insulation was installed. I do not believe in posting pictures of other machines that I, or someone else, have done in the past, I will let my feedback tell the story. I've seen it all happen, and refuse to put myself in that position. The inner cabinet liner was media blasted, removing the old galvanizing, then powdercoated silver, front and back, so the metal is now encapsulated in the powdercoating...... The same was done for the original main door cabinet liner, all the original bottle loading shelves, kick plate, coin catcher, cap catcher, drain tube assy. AND THE ENTIRE BOTTLE VENDING MECHANISM. To my knowledge, no one else is restoring the Cavalier Vending Stack Assemblies the same way I do. BEWARE MANY AMATEURS SIMPLY PAINT THESE PARTS WITH HAMMER PAINT THAT WILL FLAKE OFF IN A YEAR OR TWO.... (The horse shoes, where the bottle is pulled through, were powdercoated white). ALL ORIGINAL PARTS WERE RESTORED AND RE-USED. Restoring the original parts keeps the antique integrity in tact. The original Refrigeration unit was restored, using new fan motors, all new wiring, and a new thermostat, this machine cools perfectly, and much more quietly than the new reproduction units. 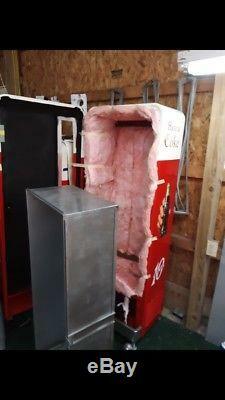 An updated coin mechanism found in this machine, has been professionally refurbished, and works perfectly, it is designed to vend at different amounts, but comes set to vend for ten cents, accepting nickels, dimes and quarters, (giving change). All the original hardware: lock bar, lock latches, lens holders, coin return bar, etc, were first zinc plated then clear coated so they do not tarnish like untreated plating. The original coin entry bezel and coin return knob were chrome plated by the best, Custom Chrome. The new parts used were all new gaskets, new plexus-glass, a new polished stainless steel face plate and both lens, wiring, fan motors, thermostat, micro switch, and solenoid. All the correct original graphics were re-applied, as well as the optional dress up graphics that were available in 1958. The Stock Market will drive you NUTS, the banks are not paying any interest..... WHY NOT ENJOY ONE OF YOUR INVESTMENTS??? Investing is a high quality Antique is a good, safe, tangible, investment. FAQ's Q: WHAT IS POWDERCOATING? A: POWDER COATING IS A NEW PROCESS. POWDER COATING IS A PLASTIC MATERIAL THAT ACTS LIKE A CERAMIC, IT GOES ON IN A POWDER FORM, THEN IS BAKED ON, AND MELTS TOGETHER, ONCE COOL, IT HARDENS THUS ENCAPSULATING THE METAL IN A NEW PROTECTIVE COATING THAT WILL NOT RUST OR OXIDIZE LIKE THE OLD GALVANIZING DID. BEWARE MANY "RESTORERS" WILL SIMPLY PAINT OVER THE OLD GALVANIZING WITH HAMMER PAINT, THIS IS A CHEAP, SIMPLE, COVER-UP. I USE A MOVING COMPANY, NOT A TRUCKING COMPANY. MY MACHINES ARE HAND TRUCKED BY A MOVING COMPANY THAT CAN DELIVER TO YOUR DOOR, PROVIDING YOUR STREET IS TRACTOR TRAILER ACCESSIBLE. YOU PAY ME FOR THE MACHINE ONLY! 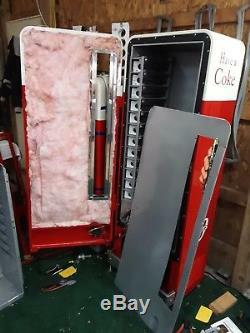 As a rule, all good quality antiques will go up in value, unless they are mis handled..... A beautiful original Coke Machine has more value than one of the same model that was mis handled by an amateur trying to do a restoration..... A professionally restored Coke Machine will have more value than a beautiful original Coke Machine, just like a professionally restored 1959 Corvette has more value that a nice original unrestored 1959 Corvette. Now imagine a 1959 Corvette refurbished by an amateur who didn't know what he was doing...... 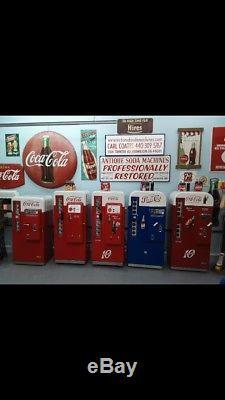 ANTIQUE COKE MACHINES ARE THE SAME!!! I know because they contact me all the time, and want to trade in their machine, that they are not happy with, on one of mine, and are disappointed when I explain that they were tricked by the Amateur and by themselves, bargain hunting..... I WOULD MUCH RATHER START WITH AN UNRESTORED ORIGINAL, THAN HAVE TO UN-DO WHAT SOME AMATEUR HAS DONE TO A MACHINE.... WHAT IS THE DIFFERENCE IN A RESTORED MACHINE AND A REFURBISHED MACHINE? Restored is doing the job correctly as I describe in my auctions..... Refurbished is taking shortcuts, not disassembling the cabinet all the way or even taking out the old insulation. WHEN RESTORING THESE MACHINE, I TRY TO DO THEM AS HISTORICALLY CORRECT AS POSSIBLE, WHILE STILL KEEPING COST IN MIND. MANY PEOPLE ARE NOT UNDERSTANDING CORRECTLY THE MANNER IN WHICH THESE MACHINES WERE ORIGINALLY PRODUCED. I TRY TO KEEP THE HISTORICAL INTEGRITY OF THE MACHINES I RESTORE, RECOGNIZING THEIR HISTORICAL VALUE. HERE IS A LIST OF MATERIALS THAT I UTILIZE WHEN DOING A PROFESSIONAL RESTORATION: EVERY MACHINE IS COMPLETELY DISASSEMBLED DOWN TO THE BARE CABINET EVERY MACHINE IS SANDBLASTED DOWN TO THE BARE METAL EVERY MACHINE IS PROFESSIONALLY REPAIRED AND PAINTED AT A PROFESSIONAL BODY SHOP. EVERY MACHINE IS UNDERCOATED INSIDE BEFORE NEW INSULATION IS INSTALLED ALL ORIGINAL ZINC PLATING IS RE-ZINCED AND THEN CLEAR COATED SO IT WILL NOT TARNISH. ALL ORIGINAL CHROME IS RE-CHROMED ALL ORIGINAL STAINLESS STEEL TRIM IS RESTORED HAVING ALL THE DENTS PROFESSIONALLY REMOVED, AND POLISHED TO A CHROME LIKE FINISH. WE DO NOT USE NEW REPRODUCTION METAL TRIM PIECES WITH AN INCORRECT PROFILE, WE DO IT THE HISTORICALLY CORRECT WAY, BY RESTORING THE ORIGINAL STAINLESS STEEL TRIM. THE ORIGINAL MACHINES WERE PAINTED WITH DUPONT ENAMEL! MAINTAINING THE ORIGINAL REFRIGERATION UNIT IS LIKE KEEPING THE ORIGINAL MOTOR IN YOUR VINTAGE AUTOMOBILE. YOUR ANTIQUE IS WORTH THE MOST THIS WAY, AND THIS IS THE WAY IT IS DONE TO BE HISTORICALLY CORRECT! ALSO THE NEW COMPRESSORS ARE MADE IN CHINA, AND ARE VERY CHEAPLY MADE, THEY WEIGH ABOUT 1/4 AS MUCH AS THE ORIGINAL, AND ARE MORE NOISY WHEN THEY START UP. BECAUSE THEY DO NOT WEIGH WHAT THE ORIGINAL UNITS WEIGH, THE MACHINES NOW BECOME LESS STABLE... A VENDO 39 WITH A NEW REFRIGERATION UNIT IN IT IS ACTUALLY A HUGH SAFETY CONCERN, IT BECOMES VERY FRONT DOOR HEAVY, AND COULD TIP FORWARD ONTO SOMEONE VERY EASILY, BECAUSE THE WEIGHT OF THE ORIGINAL REFRIGERATION UNIT WAS ENGINEERED INTO THE DESIGN OF THE MACHINE. THERE IS NO BETTER REFRIGERANT THAN THE ORIGINAL R12..... IT IS NOT ONLY THE BEST, IT IS ALSO THE ONLY REFRIGERANT THAT IS HISTORICALLY CORRECT! OLD GALVANIZING ACTUALLY OXIDIZES RESULTING IN THE WHITE POWDER LIKE SUBSTANCE YOU WILL FIND IF YOU RUN YOUR HAND OVER AN OLD PIECE OF GALVANIZED STEEL, LIKE A VENDO 81 BOTTLE LOADING SHELF. THIS IS ACTUALLY HOW GALVANIZING RUSTS, ONCE THE OLD GALVANIZING OXIDIZED, THE ORIGINAL METAL WOULD BE EXPOSED, AND ACTUALLY WOULD START RUSTING..... WE HAVE ALL OUR PARTS PROFESSIONALLY POWDERCOATED, WHEN THEY DO SO THEY FIRST SAND BLAST ALL THE ORIGINALLY GALVANIZED PARTS DOWN TO THE BARE METAL, BEFORE THE NEW POWDERCOATING IS APPLIED. ALTHOUGH IT IS NOT HISTORICALLY CORRECT TO APPLY THIS POWDERCOATING, I FEEL IT IS THE VERY BEST PROTECTION THE INTERNAL COMPONENTS CAN RECEIVE. POWDER COATING IS A NEW PROCESS. BEWARE MANY "RESTORERS" WILL SIMPLY PAINT OVER THE OLD GALVANIZING WITH HAMMER PAINT, THIS IS A CHEAP, SIMPLE, COVER-UP THAT WILL FLAKE OFF LEAVING YOUR MACHINE A MESS INSIDE. I RE- RESTORE MANY MACHINES THAT WERE DONE INCORRECTLY BY AMATEURS.... WE ALSO PAY CLOSE ATTENTION TO THE ACTUAL ORIGINAL LETTERING THAT WAS ORIGINALLY FOUND ON THE VINTAGE MACHINES AS THEY WERE WHEN THEY LEFT THE FACTORY. 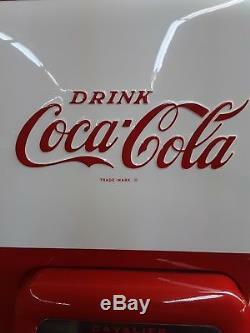 COCA-COLA WAS VERY TRICKY WHEN THEY DESIGNED THE LETTERING FOR THEIR MACHINES, THEY MIXED UP FONTS, (LETTERING STYLES), AND ELONGATED LETTERS. OUR MACHINES HAVE HAND PAINTED EMBOSSMENT LETTERS THAT NEVER HAVE ANY BRUSH MARKS, BECAUSE I HIRE A PROFESSIONAL SIGN PAINTER, AND ARTIST, WHO USES THE CORRECT SLOW DRYING PROFESSIONAL SIGN PAINTER'S ENAMEL. ANY INSINUATION THAT THIS PAINT WILL FADE IN THE SUN IS ABSURD.... YOU WILL ALSO NOTICE THAT MY SIGN PAINTER STAYS ON TOP OF THE LETTERS LIKE THE ORIGINAL LETTERS WERE DONE ON THE PRESS AT THE FACTORY.... THEY WERE NEVER SILK SCREENED OVER THE EDGES LIKE THE OTHER GUY DOES. IT IS MY POSITION THAT A RESTORED VINTAGE MACHINE IS MORE VALUABLE WITH IT'S ORIGINAL RESTORED COOLING SYSTEM, THE SAME WAY A VINTAGE CAR IS MORE VALUABLE WITH IT'S ORIGINAL MOTOR AND TRANSMISSION. YOU WOULDN'T REPLACE THE OLD TUBE AMPLIFIER IN YOUR ANTIQUE JUKEBOX WITH A NEW ONE FROM RADIO SHACK THAT WAS MADE IN JAPAN WOULD YOU? THAT WOULD ALSO HURT THE VALUE OF THAT ANTIQUE MACHINE. YOU WOULDN'T REPLACE THE ORIGINAL MERCURY SWITCH IN YOUR ANTIQUE CRANE MACHINE WITH A NEW SWITCH FROM RADIO SHACK MADE IN CHINA WOULD YOU? YOU WOULDN'T REPLACE THE MOTOR ON YOUR 1959 HARLEY DAVIDSON WITH A NEW MOTOR FROM CHINA WOULD YOU? Do you know that Harley even patented the sound of their motorcycle....... NOW DOES THAT NEW REFRIGERATION COMPRESSOR FROM CHINA THAT MY COMPETITOR USES SOUND LIKE THE ORIGINAL? YOU WOULDN'T REPLACE THE ORIGINAL 78RMP RECORD STACK ASSEMBLY IN YOUR 1948 WURLITZER JUKEBOX WITH A NEW CD PLAYER ASSEMBLY BECAUSE YOU WOULD GET A LARGER SONG SELECTION CAPACITY. YOU WOULDN'T REPLACE THE ORIGINAL 8 CYLINDER ENGINE IN YOUR 1959 CORVETTE WITH A NEW 4 CYLINDER HONDA MOTOR BECAUSE IT WOULD RUN "MORE EFFICIENTLY". Reproduction parts will always be available, but where would you ever find the original parts again? NOW, DON'T GET ME WRONG BECAUSE I DON'T WANT TO BE MIS-UNDERSTOOD.... REPRODUCTION PARTS DO PLAY A VERY VALUABLE AND NECESSARY ROLE IN THE RESTORATION OF ANTIQUE COKE MACHINES... I ALWAYS USE NEW PLASTIC DOOR LINERS, NEW GASKETS, NEW FAN MOTORS, NEW THERMOSTATS, NEW DECALS, NEW BREAKER STRIPS, NEW SOLENOIDS, NEW MICRO SWITCHES ETC. THE BEST PARTS SUPPLIER BY FAR IS STEVE EBNER AT FUNTRONICS, HE IS A SQUARE SHOOTER, AND AN HONEST BUSINESSMAN. I HIGHLY RECOMMEND THAT YOU CONTACT HIM WITH YOUR RESTORATION PARTS NEEDS. Kinda like restoring a PINTO instead of a CORVETTE. DON'T GET TRICKED INTO BELIEVING THAT OVER RESTORING MAKES A VINTAGE ANTIQUE MACHINE MORE VALUABLE, CHROMING THINGS THAT SHOULD NOT BE CHROMED IS NOT CORRECT, AND DOES NOT ADD VALUE, IT ACTUALLY TAKES AWAY.... ASK ANY ANTIQUE CAR RESTORER WHO CONCERNS HIMSELF WITH RESTORING WITH INTEGRITY INSTEAD OF FLASH. DON'T GET TRICKED INTO BELIEVING THAT RETRO-FITTING NEW REFRIGERATION UNITS INTO AN ANTIQUE MACHINE IS INCREASING THE VALUE OF AN ANTIQUE MACHINE...... ANTIQUES ARE ALWAYS MORE VALUABLE WITH THEIR ORIGINAL COMPONENTS. DON'T GET TRICKED INTO BELIEVING THAT REMOVING ALL THE ORIGINAL PARTS, AND REPLACING THEM WITH REPRODUCTION PARTS IS CORRECT, IT IS NOT.... EVERY REPRODUCTION PART ON THAT MACHINE TAKES AWAY FROM IT'S HISTORICAL VALUE. NO SHELL GAME HERE, NO PROMISES THAT CAN'T BE MET, NO LIP SERVICE ABOUT RESTORATION PROCESSES, NO PHOTOS OF MACHINES THAT ARE NOT AVAILABLE... HERE ARE MY MACHINES, RESTORED WITH INTEGRITY, AND QUALITY, USE YOUR OWN JUDGMENT, AND COMMON SENSE SHOULD PREVAIL. WHAT WE DO IS A PROFESSIONAL RESTORATION AT AN AFFORDABLE PRICE, WHILE PAYING ATTENTION TO THE HISTORICAL INTEGRITY AND ANTIQUE CORRECTNESS. The craftsmanship, restoration and look are exceptional and my friends children are having fun learning how the machine works. Perhaps most important Carl, you are a man of your word and your integrity is exemplary. You take pride in your work and this Vendo 81 D shows that pride. Oh, GREAT job on crating! 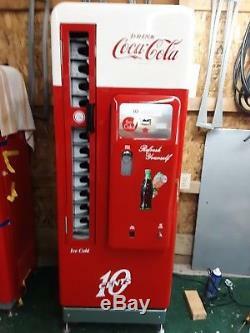 Just a note to say thank you so much for the beautiful restoration on our Coke machine. Everyone that stops over is floored, their jaws drop to the floor at how beautiful it is. If you ever need me to give a reference or if you ever want to list my comments in your ads, just let me know, I will be more than happy to brag about what a wonderful restoration you do. Regards, Lesa Pellittieri Carl, I received the machine yesterday and it is just the way you described it with outstanding craftsmanship in the restoration of it. I truly appreciate you taking the time and effort to do such a great job packing it for transport. I will certainly recommend your machines to anyone if they want quality. Thanks again, Brian Dear Carl, Sorry it has taken us so long to get back to you about the coke (81A) machine, work has been very busy. We just wanted to say thanks for such a beautiful machine it's just flawless, the detail and pride in the workmanship is just amazing, all the way down to the way you wrapped it and the moving company delivered it. Look forward to someday getting another machine from you. Thanks Steven & Theresa Theresa, thank you so much for your kind words. Carl Carl, We received machine and it is PERFECT! You have been GREAT to work with and so nice. Judy Choplin My husband LOVES his machine!!!!!! He has shown it to everyone in the town or who comes by the house. We have it loaded with drinks and ready to use. Thank you so very much for all your hard work, picture taking, information. Judy Choplin Hi Carl, Just wanted to let you know that we got the machine last Monday, and it FAR exceeded our expectations. 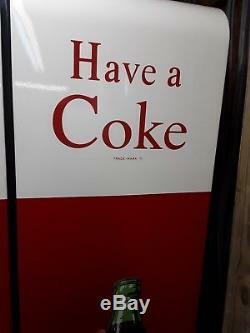 The Coke machine is amazing, I have had so many people come over just to see it and they are just amazed at how well you restored it. My husband was shocked and amazed at how well ever thing runs, and it brought back some good memories for grandparents. Thank you again, this was well worth the investment, and I know this will definitely be passed down to our kids. Take care, Elisa Carl, I got the machine home (Vendo 81) yesterday without any problem. We had a neighbor over to see it and they were amazed at your work. They said more than few times that it looks brand new. Needless to say its a great conversation piece. It even makes it more fun to discuss, since you were able to share some time with me at your shop telling me some of the history of the machines and showing me all the very fine details work through to restore a machine. Thanks again for taking PRIDE in you work! What I got was great! You are to be commended on your professional restoration. Carl, I finally got the machine today, WOW.... I never thought it would look this nice, I have visited some local dealers in the Dallas area that sell refurbished machines and I think their idea of refurbishing and yours are two different things. The machines I saw here could not hold a candle to yours, they are very cheaply done, and now that I have seen one done the right way, it is easy to tell who spends the time and effort to do an outstanding job and who does just what they have to, to get by, and sell a half aXX done machine. Great job, great machine, I will recommend you to any one looking for a wonderful piece of history. Thanks, Kyle Lastly - my impression from the outside is that the machine is totally flawless. I looked for 20 minutes - just trying to find a dink. Something, anything - but I came up empty! Kudos on a fine restoration. It is exactly as you described it MINT SHOW CONDITION. You did an amazing job on restoring every inch of the machine, we are THRILLED. We highly recommend you to any potential customers and will call you if we or any of our friends have a need for something else. THANKS AGAIN, Debra Carl, the Coke Machine is absolutely beautiful. The nicest one I have ever seen. I'm glad that I waited all those years until the right one came along. I'm sure it will bring me years of happiness. Thank You Very Much, Christine. Carl, We were in Florida on vacation a few weeks ago and stopped by a Coke memorabilia store. The guy had a Vendo 44, a Vendo 81-D, and several chest machines. Looking at his machines really makes one appreciated the work you put into yours. His did not hold a candle to mine and his was supposedly professionally restored. Rw990194 (23) Feb-05-07 18:23 -- -- Private Great merchandise. Thanks robjeep57 (347) May-31-06 05:35 -- -- Private Coke Machine is fantastic!! Tacosw (677) May-26-06 03:41 -- -- Private wow, this is fabulous. Carl's the REAL DEAL for restored machines. The best in the business. Moehoward(467) Jul-27-99 03:50 BUYERS BEWARE, AS ECONOMIC TIMES GET TOUGH, MORE CON ARTIST ARE ACTIVE. LOOK FOR THEIR FEEDBACK, ASK FOR REFERENCES.... MINE ARE POSTED FOR ALL TO SEE. 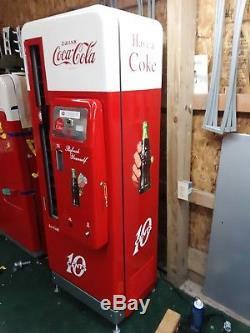 IF YOU ARE CONSIDERING PURCHASING A MACHINE FROM SOMEONE ELSE, AND THEY ARE USING MINE TO COMPARE HEIR'S TO, ASK THESE IMPORTANT QUESTIONS: NOTE: ALL THESE FACTORS HAVE A PLACE IN DETERMINING THE VALUE OF A RESTORED COKE MACHINE! WAS THE MACHINE STRIPPED ALL THE WAY DOWN TO THE BARE CABINET, AND SANDBLASTED TO REMOVE THE EXTERNAL AND INTERNAL RUST? Many amateur refurbishes will not take the machine apart, leave the original insulation, and internal rust intact, and do a quick scuff and shoot paint job, then miss-represent the machine as restored... ARE THE INTERNAL PARTS THAT WERE ORIGINALLY GALVANIZED NOW POWDERCOATED OR SIMPLY PAINTED? Painting internal parts that were originally galvanized is a cheap, incorrect substitute for powdercoating that will not hold up inside a refrigerated cabinet.... Don't allow the amateur or TV Personality to tell you different! Paint is cheap and easy and chips off. 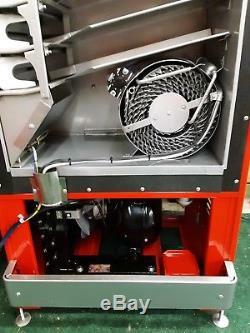 Many restorers simply replace the original refrigeration unit, with a new reproduction unit..... It is my position that maintaining the original refrigeration unit retains the antique integrity of your vintage machine, the same way keeping the original motor in your classic Corvette would. WAS THE INTERNAL RUST IN THE CABINET REPAIRED PROFESSIONALLY AND THE CABINET UNDERCOATED INTERNALLY BEFORE NEW INSULATION WAS INSTALLED? Not doing this simple step could lead to future issues..... Instead of seeing how much you can get away with, I go the extra mile, and have established practices that ensure your machine will stay restored.... IS THE PAINT JOB DONE BY A PROFESSIONAL PAINTER OR BY AN AMATEUR many amateur restorers will try to paint these machines themselves in their garage instead of paying the professional paint shop to do the job correctly! Old original machines have old wiring that is cracked and dangerous, this can cause fires or personal injury..... Old Wiring needs to be replaced!!! DOES THE MACHINE HAVE ALL NEW LEG LEVELERS THAT TURN FREELY? Old machines have old leg levelers that are always rusted in place, a proper working machine needs to be properly adjusted so the condensation water drains properly! Many old machines have rusted inner cabinet liners where the old galvanized liner has rusted through, soaking the internal insulation where it is trapped, causing these machines to rust from the inside out!!! WAS THE OLD ROTTEN DRAIN TUBE REPLACED? Many Old machines have drain tubes with an S trap that is filled with debris that won't allow the condensation to drain, this also leads to holes in liners, and internal rust 15. WAS THE ORIGINAL COIN MECH RESTORED? Huge difference in value here folks! NOT SURE WHAT THEY CALL DOING THE WRONG THING WITH EVERYONE WATCHING IS CALLED... 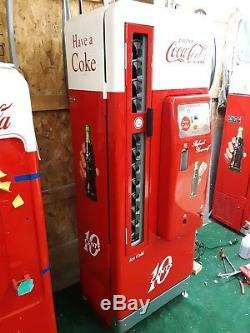 The item "1958 Coca Cola Coke Machine Cavalier 96 Pro Restoration Vendo 81 BEST IN USA" is in sale since Saturday, December 8, 2018. This item is in the category "Collectibles\Banks, Registers & Vending\Vending Machines\Soda". The seller is "sleepwalk" and is located in Elyria, Ohio.